SINGAPORE - While many may associate fans of K-pop boyband BTS with adoring teenage girls, there are some admirers of the group who buck tradition. Nestled in the sea of teenagers who congregated outside the National Stadium hours before the band's concert on Saturday (Jan 19) was 64-year-old Lilet Rodriguez. Mrs Rodriguez, who did not reveal her nationality, was in line to buy merchandise with her 30-year-old niece who works here as a domestic worker. Mrs Rodriguez, who spent $404 on two tickets, first fell in love with the group's music in 2017, when a colleague's teenage children played BTS songs on repeat. "Their songs make me happy and you can learn lessons from them too," she said, counting upbeat tunes Am I Wrong (2016) and Idol (2018) among her favourite jams. "Some people may think that I'm too old, but I don't care. "Like what RM said, you just have to 'Speak yourself''," she said, referring to the boyband leader's United Nations speech last September in which RM - whose real name is Kim Nam-joon - encouraged people to practise self-love and speak their truth. Meanwhile, 26-year-old Roxanne Alday emerged from the merchandise booth with around $700 worth of items, including premium photos of the members, several T-shirts and a few poster sets. The accountant had flown in from the Philippines to attend the concert and buy BTS goods for herself and around five friends who could not be in Singapore for the concert. "I spent around $125 on Jimin items for myself because he's my favourite member, and I bought a premium photo of him that I missed out on during their concert in Korea last year," she said. Besides Jimin and RM, the other members of the band are V, Jungkook, Suga, Jin and J-Hope. But beyond merchandise, it is the band's songs that she appreciates most. Ms Alday said she was diagnosed with clinical depression in 2018 and the K-pop group's music has helped her through some dark periods and given her strength. One of her favourite BTS songs is Answer: Love Myself (2018). "The message is so simple. We just have to love ourselves, and that really speaks to me," she said. While many fans were busy queueing to get their hands on merchandise, there were also some who went down early to distribute free items like snacks and self-designed BTS souvenirs. Ms Kimberly France, 29, was among those who gave out free snack packs to fans milling around outside the Sports Hub Library. 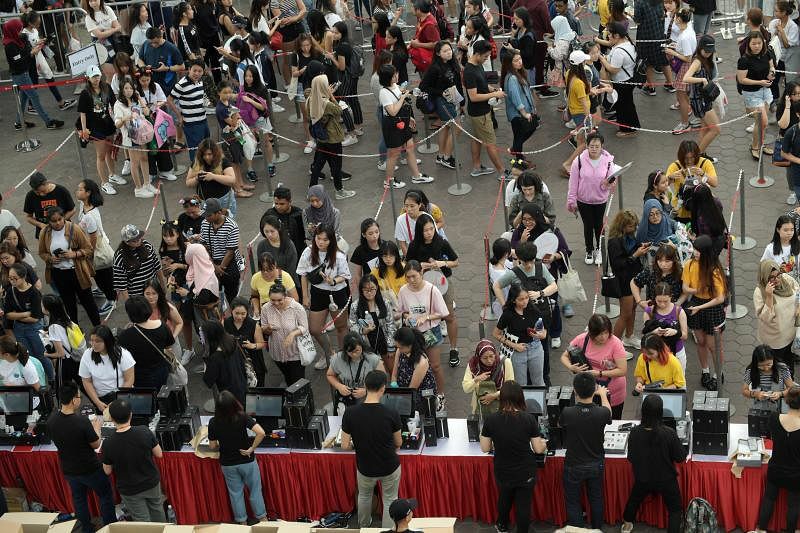 The special education teacher from Singapore came up with the idea after she realised that fans who bought mosh pit tickets would have to wait for hours in line before entering the National Stadium. With the help of three other friends who were attending the concert with her, she pooled together $160 to make 100 snack packs that included items like Oreos, tissue packets and gummy bears. The group, which included financial advisor Joanna Germaine, 28, arrived before 10am and spent around one-and-a-half hours giving out the survival packs. "The waiting time for the queue is too long, and we just wanted to help other fans," said Ms Germaine, also from Singapore. Some lucky fans also had the chance to enter the BTS Studio, where they could take photos with augmented reality (AR) versions of the boy band. Fans could sit on a sofa and a member of their choice would "sit" next to them. Sharlotte Khit, a 17-year-old fan who flew in from Myanmar for the concert, was one of them. The student spent around three minutes in the pop-up booth taking photos with the AR incarnation of her favourite member Jin. "It's really special because I now have a picture with him." "He was speaking in Korean and I couldn't understand what he was saying, but it was really fun and I just kept giggling," she said. At 7pm, when the concert was scheduled to start, the level of excitement hit near fever pitch. But the mosh pit was only half filled and fans were still streaming in, having been delayed earlier due to snaking queues outside the National Stadium. Thousands of fans had started queuing at 4.30pm in blistering heat. Fans had to go through bag and other security checks before they were let through. The heat and excitement resulted in a number of people fainting outside the concert venue. Inside, the stadium shook as fans sang along to music videos playing on two large screens, as they waited for BTS to take to the stage. They chanted and screamed the names of each member of the group while Army bombs – the boyband’s designated concert handheld light at $55 each – lit up in sync to the songs. Like the others, Ms Nazurah Jaafar, 24, was impatient for the concert to start. It is the medical technologist’s second BTS concert. She attended her first in Seoul last year. “Just the fact that all these fans are here together for BTS makes me feel really pumped up,” she said as she entered the stadium.